Netputing » Apple to release new 3D UI based mobile device OS 4.0? I have been reading the newly unearthed patent from Apple about the 3D UI… and my conclusion is that Apple won’t just introduce a new mobility device at the end of the month… they will show off what the next iPhone 4.0 OS will be like. What Apple is about to do is add a new 10 (and possibly 7) inch screen to the iPhone/iPod Touch portfolio. All those devices will be running a new 3D UI. Applications will run on all those devices using a new 3D user interface that is sure to blow people away. I think Apple is about to re-invent how people interface with applications and OS on their mobile device. The patent application illustrates this. 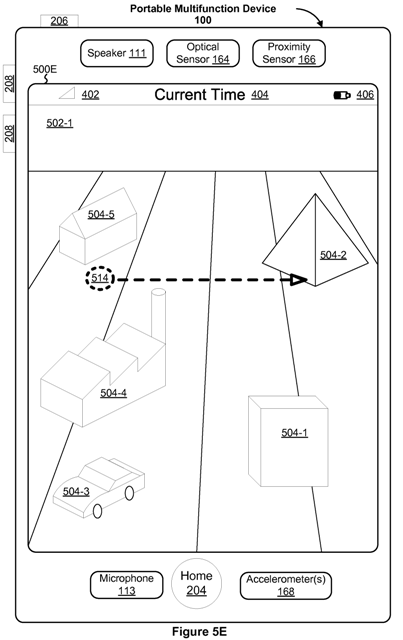 The device depicted in the patent filing to represent the 3D UI is obviously an iPhone/iPod Touch like device… but can surely scale to a much larger 10 inch screen.